Look, if I really wanted to, I could pick out any number of flaws in tonight’s Community right off the bat and fairly easily. The character of Pierce is regressed to a stock type so he can be a handy villain. The ending is awfully abrupt. Britta, too, seems like she’s playing to her character type for a few too many easy jokes. Troy’s line about wanting to play Chutes & Ladders is an awfully easy joke, particularly at such a critical point in the episode. The whole notion of trying to get us to care about a guest star who’s never been a particularly important character until now is one that every show has tried at one point or another, and it rarely works well. And there’s a tendency to occasionally reduce all of the regular characters to a sort of Greek chorus (though that’s inherent in the game they’re playing). But none of that matters to me, not really. I’ve never played Dungeons & Dragons in my life, but “Advanced Dungeons & Dragons” is so effortlessly, endlessly inventive and captures so well what it’s like to get together with a group of your best friends to have a game night that all of these flaws can either be explained away or smoothed out. The sense of fun, of possibility, that this show thrives on is here in spades, and the actors seem to be having fun, too. Again, it’s all of them around one table, engaging in some sort of group storytelling, and there’s nothing on TV quite like watching this cast ping pong off of each other. From the segment where everyone introduces their characters (including Marrrrr, Bing Bong the Archer, and Hector the Well-Endowed) on, “Advanced Dungeons & Dragons” just kept getting more and more fun to watch, the jokes piling on top of each other, and the story actually making a sort of twisted sense, a fantasy epic told mostly in one room. And isn’t that what a tabletop roleplaying game aspires to be? The opening voice-over does a nice job of laying out the saga of Fat Neil, a character who’s popped up in one episode before this. He was a kid who retreated into the world of fantasy in high school because the real world wasn’t up to his liking. It’s a stereotype, sure, but it’s one with a reason: Lots of people who like geeky things (present company included) got into those things in adolescence as a way to get invested in a world that sucked less than the one they actually lived in. (Not to get all Muppet Babies on you, but there’s nothing like imagination to make your room stop looking kind of weird and making you wish that you weren’t there.) Once he got to Greendale—depicted on a nicely-drawn, fantasy-style map, the episode’s largest overt nod to the fantasy epics D&D was originally based on—he thought things would be better, but right away, someone gave him the nickname Fat Neil, and the nickname stuck. Jeff befriends Fat Neil by faking an interest in D&D, but when the kid gives him all of his D&D manuals and says he won’t be needing them anymore, Jeff becomes concerned. Now, I’m sure some folks will wonder just why Jeff makes the jump to concern for his fellow man so soon in this episode, when he usually only makes that jump after trying to limit his human involvement to the absolute minimum, but at the end, in an ABSOLUTELY SHOCKING twist, it turns out that Jeff coined the term “Fat Neil,” which was something Neil didn’t know. All of this could be construed as over-obvious, but the show cast a fairly somber, understated actor in the Fat Neil part, and that makes it all work. Charley Koontz doesn’t really fit in with the wildness flying all around him, but, then, he doesn’t have to. His job is to be the human center that the insanity revolves around, and at that, he performs very well. I don’t know if Fat Neil will become as beloved a part of the Greendale repertory company as Leonard or Starburns, but he makes sense as one of those normal people who watches the central group and probably wonders just what the hell they’re up to. This is an episode that uses every member of the cast well. It’s definitely an ensemble-heavy hour, which means that many of the characters retreat more into the background than they’ve been this season, in favor of Jeff’s quest to right his wrong, but everybody gets a handful of killer lines. I’ve seen some complaints from others who’ve seen the episode early that Pierce turns too villainous here, and while I can sort of see that point of view, the episode also needs a villain. In its own way, this episode conforms to the specifications of a fantasy tale, even if it’s all set in a community college study room (but for a few short scenes), which means that it needs a broad, over-the-top villain. Pierce’s insecurities about his place in the group (and, indeed, his place in the world) have been so well-established at this point that I get his sudden, abrupt vengeance. I’m sure he’ll snap back to befuddled, slightly lovable old man come next week, but the situation hit too many of his greatest fears square on the nose. This brings me to a larger point I’ve been wanting to make about large-ensemble sitcoms for a while. In a large-ensemble sitcom (as Community is), it’s virtually impossible to play all of the shades of all of the characters in any given week. You can occasionally get one episode that gives every character a big moment to shine—“Cooperative Calligraphy,” say, or Parks & Recreation’s “The Flu”—but it’s very difficult to make sure everybody is a recognizable human being and not just a type every week. I’ve seen complaints this season that, say, Shirley too often gets reduced to “the Christian” and Jeff too often gets reduced to “the womanizer,” and while there have been strings of episodes where that might hold true, I don’t think they hold true for the season as a whole. The strength of an ensemble sitcom often lies in how well everyone reverts to their basic type while still being able to play unexpected character notes at any given moment. When we start the episode, we need to start at a certain home base. From there, some of the characters travel farther than the others, before returning to a place that’s roughly the same as where we started. Take, for instance, Pierce in this episode. He starts as, more or less, himself—an old guy who feels threatened by the other members of the group seemingly trying to cut him out. When that conflict escalates, he devolves, retreating even more into his base type. But at the episode’s conclusion—where he realizes that everyone feels sorry for him—he can return to something like where he started, still an old man scared of being cut out but now one who is at least open to the possibility of playing another game of D&D with Neil. Sure, it’s not the world’s most sophisticated character arc—what is, in 21 minutes?—but it takes the character through a set of paces that examine why he is the way he is and then breaks him down somewhat. The ending, where Pierce needs validation and Neil (who previously needed it) is able to give it to him, underlines the show's ability to go from hilarious to heartbreaking/heartwarming in an instant. This is all pretty high-minded, admittedly, but I think it’s a sign of the show’s strength, not a sign of its weakness, that it knows exactly how far it can push all of these characters. I think what people may be looking for is something like character growth, an arc that is clearly definable and easy to pin down, but I don’t know that we can see something like that until we have the entire series before us. These characters are growing and changing, yes, mostly by being in proximity to each other, but it’s not a process that happens all at once. It’s a process that will take however many seasons the show lasts. The people at Greendale need each other on some level, and we, like they, are too close to the situation at present to really know where all of this is headed. But, OK, that’s not what you came here to hear about. You came here to hear what was funny. And this episode was riotously funny, perhaps the funniest episode of the season. The biggest laugh might have come from an entirely wordless sequence, involving Annie—as Hector—and dungeon master Abed—as an elf maiden—talking out a sexual encounter that seems to alternately titillate and horrify everybody. (Annie’s “Shh… shh…” when Abed starts to protest was hysterical.) The episode had just the right amount of Chang, letting him get really into his drow character but then having him beat a hasty exit from the story when Pierce got the lucky strike that killed his longtime character (a moment the show treated with the appropriate pomp sincerity). It had Troy’s strange interjections and Britta’s attempts to form a friendship with a fictional gnome waiter. It had Pierce constructing an evil throne out of paper supply boxes. In short, it had an endlessly inventive string of gags and moments that topped each other, the kinds of wild, crazy jokes that this show tosses out, seemingly like it’s no big deal. But most of all, as mentioned, it had that sense of FUN, of just about anything being able to happen at any moment. There’s a tendency to fear that Community will get too high-concept, will eventually chase its pop culture love into a rabbit hole and never come out again. 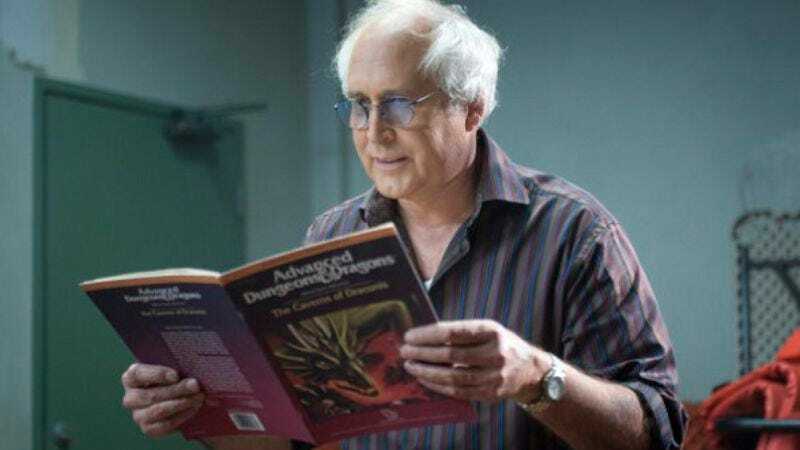 “Advanced Dungeons & Dragons” was a great reminder that the show is capable of investing the same sense of zest and spirit it brings to something like “Abed’s Uncontrollable Christmas” to nearly any episode it does. This is an episode about a bunch of people who sit together around a table and lose themselves enough in a collective story they build together that they cheer a final die roll like it’s someone actually slaying a dragon (or, more accurately, a naked man controlling the dragon). It comes as close to anything I’ve seen of capturing that feeling you get when you’re hanging out with friends, and you all decide to do something that could have been a huge flop, but it ends up being awesome because you’re with people you love and care about. It’s the feeling you get when something that can’t be real becomes real for everyone involved, for just a second. I have never played D&D, so I’m sure I’m missing a host of references that regular players will catch. Regale me in comments! I’m really impressed with the music that Ludwig Göransson has been turning out this season. Some really nice stuff, and I enjoyed the Lord Of The Rings-esque tunes tonight. I also thought this episode was really well-directed, with the constantly moving camera making the study room feel like an epic battle scene. Unfortunately, my screener didn’t have a director credit on it. "Known also as Pierce the dickish and grandpa the flatulent"
"At the end of the meeting, they realized that Chang was there and felt too awkward to mention it." "When you play it, it makes you happy. Like a … dragon!" "I made that one with Troy in mind." "I attack them, using my… additional notes." "In about 13 turns, he will die of exposure. Jeff." "I wait 14 turns." "You have successfully rubbed your balls on his sword." "And as they described themselves walking, so did Abed confirm that they walked." "Why is he a pirate?" "I can't tell you how long I've dreamed of this moment… in the game." "Britta, he was an imaginary waiter." "I wouldn't expect you to understand." "Draconis, an all-powerful red dragon, crashes through the trees of the clearing. Riding atop his shoulders, naked as the day he was born, controlling Draconis with the amulet is … Pierce Hawthorne." "I can make it up to you. I'll find a fatter Neil." "Huzzah." "He's bald! He's black!" "Well, I don't look at the world through that lens." "I won Dungeons & Dragons, and it was advanced!" "If you had a tail, people could always tell when you were happy!"